This deposition (comprising 1 page and signed by me) is true and according to my understanding. I testify with the knowledge that, given evidence to the contrary, I will be subject to arrest in the case I have voluntarily testified about something that I know to be false or not to correspond to the truth. 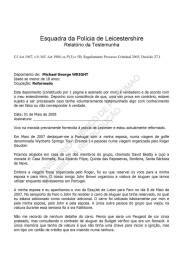 I live at the address previously furnished to the Leicester police and I am currently retired. 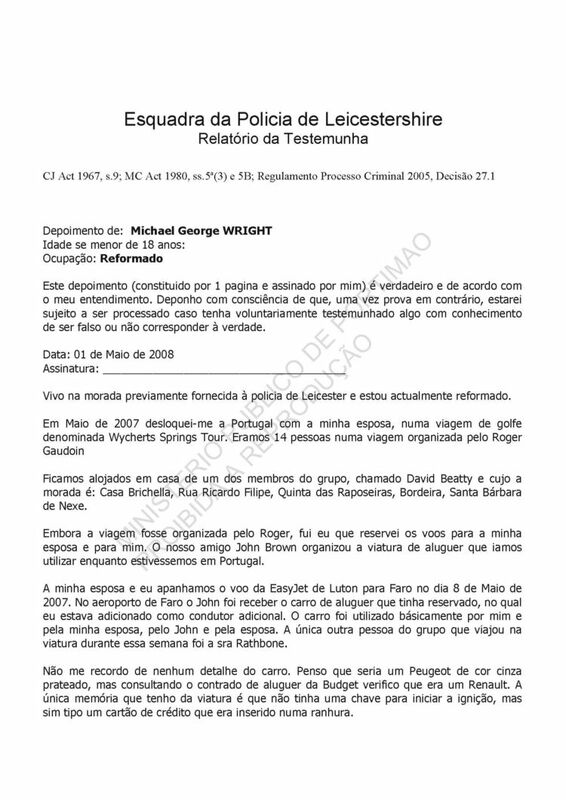 In May 2007 I went to Portugal with my wife on a golfing trip known as Wycherts Springs Tour. We were 14 people on a trip organised by Roger Ga.
We were lodged in a house of one of the group members named David Be. and whose address is: Casa xxxxxxxxx, Rua Ricardo Filipe, Quinta das Raposeiras, Bordeira, Santa BÃ¡rbara de Nexe. Although the trip was organised by by Roger, it was I who reserved the flights for my wife and for me. Our friend John Brown organised the rental vehicle that we were going to use whilst we were in Portugal. My wife and I caught the Easyjet flight from Luton to Faro on 8 May 2007. At the Faro airport John was to collect the rental car that he had reserved, on which I was added as additional driver. The car was used basically by me and my wife, by John and his wife. The only other person of the group who travelled in the vehicle during that week was Sra Ra. I don't remember any detail of the car. I think it was a silver-grey Peugeot, but consulting the Budget rental contract I confirm that it was a Renault. The only memory that I have of the vehicle is that it did not have a key to start the ignition, but some kind of credit card that was inserted into a slot. The car was returned to Rent-a-Car at the airport on 15 May 2007 at the end of our stay. But no-one other than John Brown and myself drove the vehicle during that week. 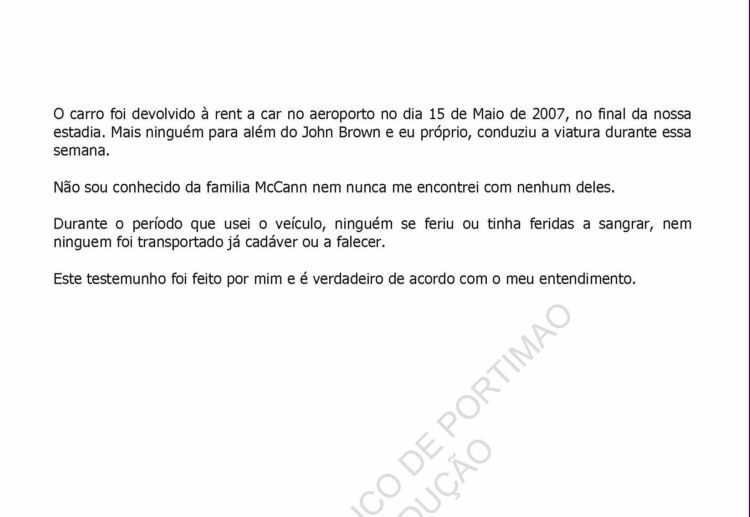 I am not known by the McCann family nor have I ever met with any of them. During the period that I used the vehicle no-one was wounded or had wounds that bled, nor was any cadaver transported nor did anyone die. This testimony was made by me and is true according to my understanding.